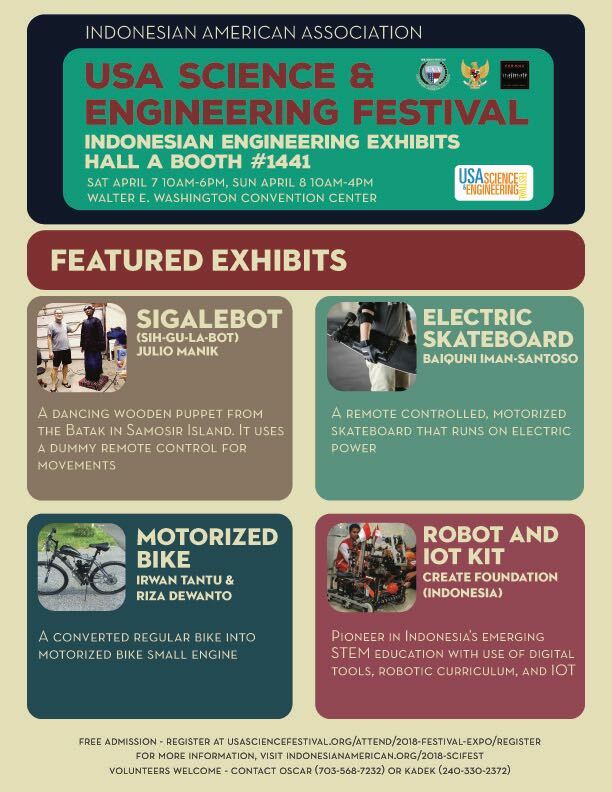 IAA is proudly announcing our first-ever participation of Indonesian organization in the 5th USA Science & Engineering Festival Expo on April 7-8, 2018! It is the largest STEM expo featuring 3,000 hands-on exhibits from the world’s leading scientific and engineering societies, universities, government agencies, high-tech corporations and STEM organizations. The two-day Expo is perfect for children, teens, and families who want to inspire their curious minds. Sigalebot by Julio Manik, a full-size robot based on traditional North Sumatran puppet Sigale-gale. IAA’s booth will be located on Hall A, Booth 1441. The event is on Sat Apr 7 10am-6pm and Sun Apr 8 10am-4pm, 2018. Sneak peek Friday on Friday, Apr 6, 2018. Admission is free, but registration is required. Donations are suggested.